and created the Beertender. It takes those Heineken kegs that you get from the grocery store and makes them even more amazing. Our anniversary is on Thursday and I believe the fourth anniversary is the frivolous, over-indulgent, binge-inducing, Dutch invention anniversary. Well, I think that's all I need to say about that. 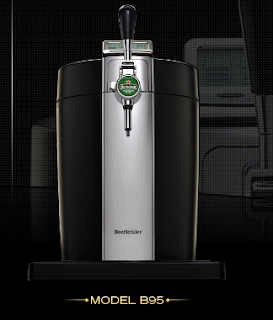 I hear from other folks that the Beertender is amazing and everybody knows how much I love Dutch beer. I think it also doubles as a nanny. With that said, why is it that I love Heineken on some days and think that it tastes like <insert word meaning putrid or rank here> on others? I'm sure that it will taste wonderful everyday with the Beertender serving it up.